Cyrenaica (/saɪrəˈneɪ.ɪkə/ SY-rə-NAY-ik-ə; Arabic: برقة‎, translit. Barqah; Koinē Greek: Κυρηναϊκή [ἐπαρχία], translit. 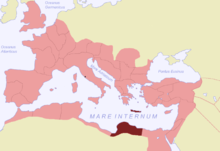 Kurēnaïkḗ [eparkhíā], after the city of Cyrene) is the eastern coastal region of Libya. Also known as Pentapolis ("Five Cities") in antiquity, it formed part of the Roman province of Crete and Cyrenaica, later divided into Libya Pentapolis and Libya Sicca. During the Islamic period, the area came to be known as Barqa, after the city of Barca.